Our Children's Easels give younger students a spacious, sturdy and comfortable dry erase board surface to make presentations, practice penmanship, and perform a wide range of other classroom and art activities. We offer Easels with storage compartments for toys, markers and supplies, as well as models with ledges where teachers can prop up and read big books. 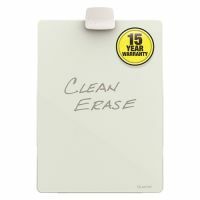 These Dry Erase Easels are easy to set up and easy to store. Equip your classroom or playroom with a Children's Easel today and make classroom lessons interactive and hands-on.